I think I have mentioned a million times how much I love to read children’s books. It was my favorite thing to do as a Nanny and now a mommy. Any book goes and I am always looking for a nice sweet story. Harper Collins Canada sent me a very sweet book called Nico and Lola by Meggan Hill. The amazing photography is by Susan M Graunke. It looked like it might of been a sad book so I read it to myself first to make sure there was nothing in it that a 3 year old would need an early explanation for. The story is about a little boy who looks after his Aunt’s dog while she is away. He is excited for Lola to arrive but a little worried about if he will be kind enough. The pictures in the book are so cite you just want to pick both Nico and Lola up and give them a big snuggle. 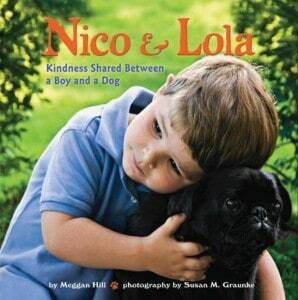 Nico plays and has fun with the little pug and shows his kindness by spending time with Lola and feeding him and taking care of him the best way he knows how. It’s a lesson on kindness that can open a conversation between you and your little one to teach them that kindness is an important act to display. I love that this book can grow with your child as well. It is a lengthy book but you don’t have to always read the long version of the book because there is a shorter version on the opposite page that will sum up what the longer version is trying to say. It will keep your toddler or preschoolers attention and when they get a bit bigger you can start reading the whole book to them. Nico and Lola retails for $18.99.